I voted today, in my state’s primary election. I’m grateful to those who came before me, who fought, suffered, and even died so that I might cast my ballot at the local fire station with my neighbors. Because it’s election season, I’m hearing a lot from a lot of people about what makes a good citizen, how to nurture an informed citizenry, and what forces are at work in our culture right now that make that more difficult. We are certainly in an upheaval, aren’t we? I see this as a time of great transformation, on a fundamental level. That naturally feels like a disaster, but it’s also an opening. 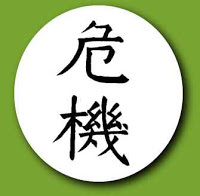 You may know that the Chinese character for crisis is the same for opportunity. Both can be true simultaneously. Jon Kabat-Zinn calls this the “full catastrophe” of living. F.M. Alexander, in his exploration of human psychophysical functioning, discovered an organizing reflex which operates either well or poorly, depending on the relationship of the head and the spine (specifically the neck, or cervical spine). In Alexander lessons, we rediscover this reflex, which Alexander called the primary control. It is “primary” because when it is operational everything else falls into place. It is a “control” in the sense that a steering wheel on a car is a mechanism for controlling the direction of the car. For years I resisted using Alexander’s term, because I had a problem with the word “control.” My experience of lessons was a letting go of the need to control; freedom was established by non-doing, allowing the body-mind to find its own way, and trusting my inherent balance and coordination. I didn’t accept that there was control in this, but I was wrong. It just wasn’t my direct control that was operating. Ever had a movement experience that was so unified, so much in the flow, that it felt like the running/walking/biking/swimming was doing itself? Your primary control was fully operational. A healthy relationship between your head, neck, and back was possible, and it triggered this organizing reflex, which then in turn clarified the relationship of all the parts to the whole. When I allow my primary control to shine brightly, everything falls into place and living is easier. This feels important today, because of this huge (some would say “YUGE”) fundamental change we are experiencing in the U.S. and globally. Knowing that we are born to be balanced and coordinated in movement gives me permission to engage both my primary control and my primary political process with integrity, curiosity, and even a little hope.